When you're picking a shawl pattern, or designing your own, there are a few basic construction recipes to start from. You can start with the recipe and alter it by adding texture, lace, color. You can also add a knitted-on border after the basic shape is made. The shapes here are of the triangular, crescent or semi-circle variety. Rectangular shawls will be in another article. For most shaped shawls, thorough blocking is required to get them into their final geometry. 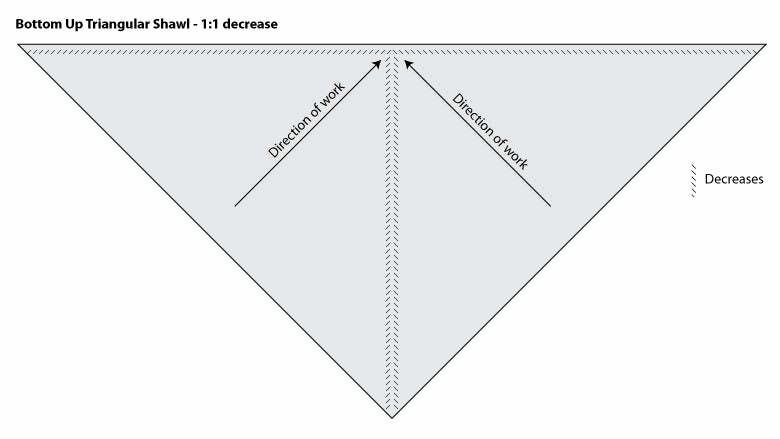 The top down triangle is one of the more commonly used shapes. The advantage to this is that the cast-on is very small (most start with a 3-stitch wide), so your commitment is small. A good choice if you're experimenting with yarn options. Also a good choice if you're not sure of your yarn requirements; you can stop anytime after the depth is about 20 inches, and still have a wearable shawlette. The disadvantage is a long cast off. The basic triangle starts at the center top, and increases along the edges and center, usually at a rate of 4 increases every RS row. 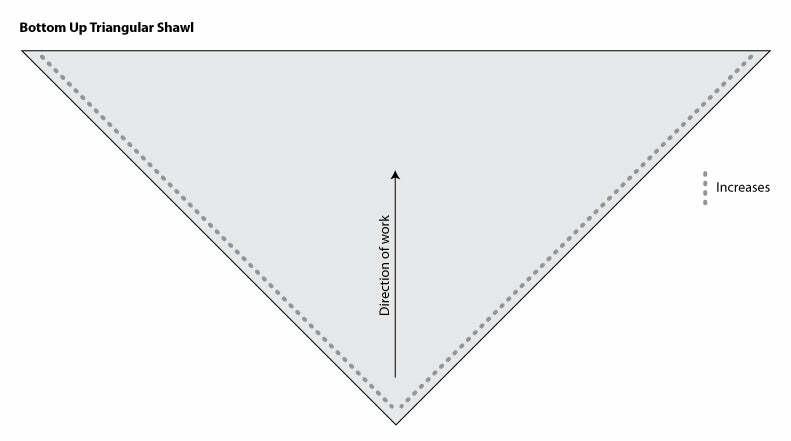 Similar to the Top Down Triangular Shawl, you don't see the bottom up triangular shawl as often, probably because the cast on is very large. The decreases are done along the edges and center, usually at a rate of 4 decreases every RS row. The advantage to this construction is the progress gets faster and faster as your rows get smaller.The disadvantage is that you need to have enough yarn to finish; if you stop early, you'll have an L shape rather than a triangle. 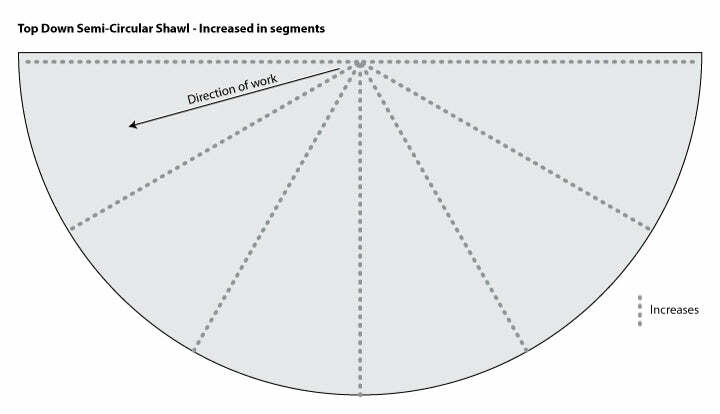 With this kind of bottom up triangle, you start at the bottom point, then increase along the edges, usually 2 sts every row or 2 sts every RS row. 2 sts every row will make a very pointy triangle, pretty for kerchiefs. Often, this construction is embellished with a knitted-on border. With the end-to-end shawl, you start at one wing tip, increase along the edge, then work straight for the center portion, then decrease for the other wing tip. A lot of advantages to this shape; you can make a scarf-like shawl this way, and you can also judge how much yarn you will need to finish once you reach the center point. A note about end to end shawls and variegated yarns. Hand painted yarns, or self-striping yarns, may not work as you expect with this. You might end up with color pooling at the tips, but not in the center. Semi circular shawls are often lacy, and usually have a traditional feel. You start with a small cast on and then increase several stitches every 8 rows or so (this increase rate varies a lot, depending on the pattern). Like the top down triangle, the advantage is a small cast on, but of course that means a very long cast off. A bottom up crescent shawl is a lovely alternative to the more geometric triangles and semi circles. They start with a long cast on, and then are shaped by working partial rows and turning (ie, short rows). The crescent shape is formed by having more rows at the center than at the edges. The advantage to this shape is that is yarn-efficient; you'll get a nice wing-span to wrap around your shoulders but without those wasteful points. The disadvantages are a long cast on and a more complex pattern; you'll have to follow the pattern closely for the short row shaping.